The Roswell UFO controversy may be 64 years old, but it shows no sign of heading into retirement. 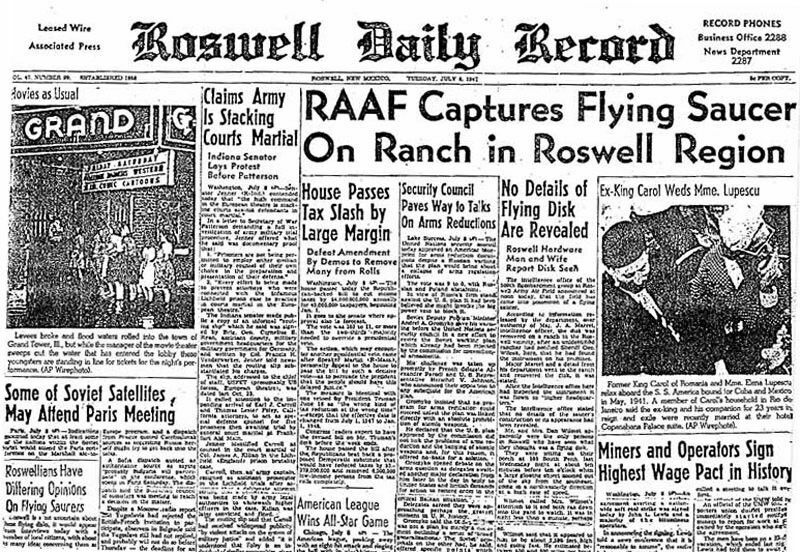 One thing we know for sure: On July 8, 1947, the front page of the Roswell Daily Record proclaimed that a flying saucer had been captured by the Roswell Army Air Field. The U.S. Air Force had issued a press release that day stating that a flying saucer had been “captured,” and photos were released of soldiers examining metallic-looking objects, presumably pieces of a crashed balloon. Then the controversy began. At a press conference later that day in Ft. Worth, Texas, Air Force Brig. Gen. Roger Ramey essentially recanted the entire story, announcing instead that the debris was simply pieces of a fallen weather balloon. Speculation of what really happened has never truly ended. George Filer, a retired Air Force intelligence officer, told The Huffington Post that he believes Ramey was forced to lie about the Roswell incident. Over his 20-year career, Filer regularly briefed generals and congressmen about a wide range of security issues, including UFO sightings, up through the Vietnam War. “It is my opinion that President Truman was there [at Fort Worth] and that he made the decision that it should be held at the highest levels,” Filer said. None of this comes as a surprise to former nuclear physicist Stanton T. Friedman. He’s the original civilian investigator of the Roswell UFO incident and the most outspoken scientist who believes there is overwhelming evidence that alien spacecrafts are visiting Earth. He, too, has talked with Mrs. Ramey. “From talking to her, I had no reason to believe A) that she knew intimate details about Roswell or any other such event; or B) that she made up this story because it is consistent with a man of reasonable character who followed orders as one would certainly have expected him to,” Friedman said. Both Filer and Friedman — the military man and the scientist — said they believe the Roswell UFO was an alien spacecraft, that Earth is currently visited by extraterrestrials and that only individuals with very specific “need to know” credentials have access to this information. Both are speaking at next week’s MUFON Symposium in Irvine, Calif.
New wrinkles are constantly being added to the Roswell conspiracy theory. Author Annie Jacobsen unveiled a whopper this year in her book “Area 51: An Uncensored History of America’s Top Secret Military Base,” that alleged the alien spaceship crash was actually a hoax contrived by Soviet leader Joseph Stalin and Nazi scientist Josef Mengele. There was no crash, according to Jacobsen, but the Communist dictator and “the Angel of Death” allegedly sent children surgically altered to look like aliens to Roswell in a remote-controlled craft to frighten Americans. Friedman echoed Filer’s sentiment. “People need to recognize that the real situation about where we fit in the scheme of things is very different from the way it’s been portrayed,” Friedman said. “In my view of what’s going on, there are loads of civilizations out there all over the place, and that we are not very significant. NASA’s about to declare ‘no fly zones’ on the moon!